A retrospective analysis was performed on all obese patients with T2DM who underwent a LRYGB during the period 2011–2013. 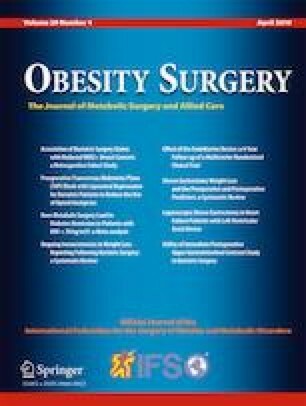 Demographics, preoperative body mass index (BMI), preoperative glycated hemoglobin A1c (HbA1c), adherence to lifestyle intervention, preoperative medication of insulin, and the time interval between surgery and diagnosis of T2DM were investigated and compared. A total of 24 patients were included in our study. The median age was 45.5 years, the median BMI was 29.9 kg/m2, and the median HbA1c was 7.9%. Out of 24 patients, 54.2% (13/24) experienced a relapse of hyperglycemia. The 1-year, 3-year, and 5-year relapse rates were 4.2%, 12.5%, and 50.0%, respectively. The preoperative HbA1c level, C-peptide (2 h) level, and C-peptide (3 h) level were identified as independent variables for the relapse of hyperglycemia (8.11 ± 0.48 vs 7.72 ± 0.37 kg/m2, p = 0.036; 4.35 ± 1.46 vs 7.13 ± 4.10 ng/ml, p = 0.032; 3.76 ± 0.61 vs 5.99 ± 3.39 ng/ml, p = 0.029). Lifestyle intervention could reduce the hyperglycemia relapse rate (66.7 vs 41.7%) after LRYGB surgery. The preoperative HbA1c level and C-peptide level at surgery have an important significance in predicting the relapse of hyperglycemia after LRYGB surgery; lifestyle intervention is crucial for these patients.